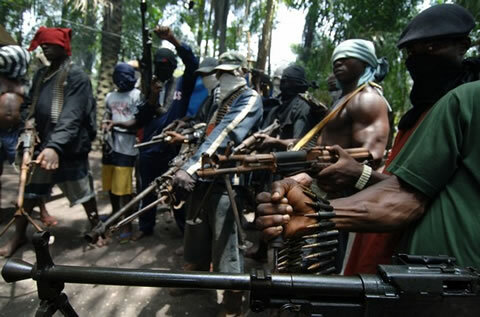 A new militant group called The Isoko Liberation Movement has promised war if their demands which includes the dissolution of Nigeria, are granted. “We the Members of Isoko Liberation Movement, after much consultations with our fellow Brothers in the struggle for the peaceful disintegration of this fraud called Nigeria Wish to Issue the Following Statement." Agitators in The Struggle for the actualization of Niger Delta Republic"
"We commend and Support our Fellow Brothers (IPOB) and their peace struggle to the actualization of the Baifra Republic. But we wish to let them know that peace and lengthy litigation’s will not yield any result in this corrupt and wicked Islamic Government controlled by an illiterate old fool." "We advise all Niger Deltan’s still living in the northern and western part of the country to return home within seven days as their safety cannot be guaranteed after then." "We advise the Buhari Lead Government to as a matter of urgency call a national conference to discuss the peaceful disintegration of Nigeria or standby and watch the country sink." "We are giving the Buhari Led Government of this fraud called Nigeria seven Days to Release IPOB Leader kanu Nnamdi or we shall rain hell on all oil installation within the Isoko Land." "For all those Isoko politicians who thinks they want to work with the Nigeria government to fish us out, our advice for you is watch your back, for we know all your every move." Having said that, the big questions in most Nigerians mind are, could this region afford another civil war as being clamored? Can these group indeed finish what they are starting? Let keep our fingers crosses, War is beyond armed bandit threatening a nation.